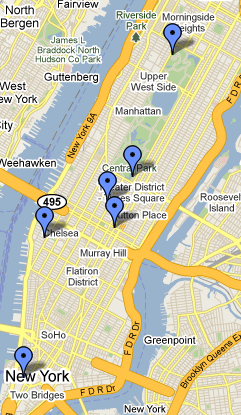 I’ve been asked by many friends about where to skate in New York City over the holidays. I want to tell you, what I tell them, because this is the perfect time of year to go ice skating in NYC. Whether you’re a tourist visiting New York, or a longtime resident, nothing quite compares to the experience of gliding across ice underneath the tall facades and lights of Manhattan. If you are visiting NYC, I suggest you also see Captain G’s Guide to see NYC in a day or two, an excellent list of things to do in NYC. Of all of the ice skating options in NYC, I’d recommend Wollman and The Pond. Wollman Rink and The Pond at Bryant Park have the most convenient locations, the most interesting alternative entertainment venues nearby, and acceptable lines and crowd sizes. Below are all of the ice rinks (with a map showing approximate location) with their websites and phone numbers for your reference. As a rule, outdoor rinks are seasonal, and are converted in fields, gardens, or amusement parks once the weather begins to soften, while indoor rinks are open year round. A brand new ice rink just opened up last November at downtown Manhattan’s Battery Park City, north of the World Trade Center along the West Side Highway. This mobile rink is supposed to be eco-friendly, sustainability minded, and one of the most energy efficient in the country. The rink is open Monday to Friday from 1pm–10pm, Saturday 10am–10pm, and Sunday 11am–9pm. Battery Park City on Ice will stay open until February 15, 2010. Giant, heated exhibition tents provide a place to rest in between skating, and a refreshments stand provides food and drink. Admission is $10, and skate rental is $3. While the rink is definitely interesting (especially it’s eco-friendly features), it’s surrounded by construction buildings. I wouldn’t recommend this spot if you’re looking for a scenic skate. Located at Rockefeller Center, this is the most famous (and most expensive) rink in New York City! The rink is usually packed, and we recommend you go early in the morning to avoid the one to two hour wait. Prices vary depending on what day you go (it’s usually pricier around Christmas), and admission provides access for a single session only; this is typically an hour and a half. It’s typically open from late September all the way to late March. Very scenic, and the iconic skating experience in the city, set in the backdrop of the statue of Prometheus – if it weren’t for the small-ish size of the rink, the crowds, and the wait time. Ultimately, this rink is a tourist trap, and city visitors and residents alike can find better. During the winter, Bryant Park converts into an amazing seasonal event spot. Besides an ice rink, the park turned exhibition tent complex includes holiday shops, an indoor pavilion and the Canadian-themed lounge Celsius, which conveniently offers a full children’s menu and plenty of hot chocolate. Admission is completely free, but skate rental is $12, which just about puts it even with the other ice rinks. This is one of my favorite ones to go to. It’s set against the backdrop of a beautiful public park, not too crowded, and has shopping within the park and nearby along 5th and 6th avenue. The rink is seasonally open between November 6 to January 24. Hours are Sunday to Thursday 8am–10pm; Friday and Saturday 8am–midnight. This rink is in the upper part of Manhattan, right at the northern edge of Central Park. Although it has two huge ice rinks, I haven’t gone to this rink because of its location and hours. The rink hosts local hockey games, and so hours are very specific, depending on which day you want to go. Generally, it’s open Monday to Thursday from 10 AM to 3:35 PM, Friday 10 AM – 11 PM, Saturday from 1 – 11PM, Sunday 12:30 – 4:30 PM; on Tuesdays, it’s also open during the evening 8 – 10 PM, and on Friday, it’s open 7 – 11 PM. Ultimately, I’d suggest avoiding it, since it’s out of the way, and the schedule is a little confusing. Sky Rink is unique among the ice rink offerings in that it’s indoors, and open year round. It’s located on the western edge of Manhattan, past the West Side Highway. This is another rink that’s slight out of the way, and not scenic at all, but it’s worth the trip if you’re either determined to skate out of season or at a rink that isn’t crowded. Most of the times I’ve been here, there were very few people on the ice. Hours are Monday and Thursday 1:30 – 5:20 PM, Tuesday and Thursday 3:00 – 5:20 PM, Saturday and Sunday 1:00 – 3:50 PM. Adult admission is $13, youth is $10.50, and skate rental is $7.50; considering the location, and the lack of scenery, I’d suggest avoiding this one unless you want to skate in the middle of summer or practice your skating in a less crowded rink. This rink is another favorite of mine. Located at the southern end of Central Park, Wollman is located near several subway stations; is set in the backdrop of Central Park; and isn’t too crowded during the non holiday winter season. I personally prefer going during the late morning and afternoon, though; since the park doesn’t have much lighting, Wollman Rink switches on stadium lamps once it gets too dark. Admission prices vary, depending on age and day of the week you go (admission is higher for adults and when going Saturday or Sunday). Skate rental is $6.25. Hours are Monday and Tuesday 10:00am – 2:30pm; Wednesday and Thursday 10:00am – 10:00pm; Friday and Saturday 10:00am – 11:00pm; and Sunday 10:00am – 9:00pm.